We've included several alternative landing pages for affiliates. These include PPC/AD network friendly pages as well as sub-niche targeting. TIP: If you're using Google PPC, please do not link the ad directly to your affiliate link. Google HATES affiliates that does that and punishes you with low quality scores. Instead, direct it to your own landing/bridge page. The best type of bridge page is a unique high quality review article. This presells your visitor. Setup your campaign to target this group: Age: 30 to 65, Male. NOTE: Tests have shown that sending 3 emails will result in the most sales. No matter how many emails you intend to send, the 3rd follow up email should be the last. It is high pressure and it converts the highest. WARNING: You should NOT send unsolicited emails and must comply with CAN-SPAM. Spammers will be reported to Clickbank and banned from promoting our product. 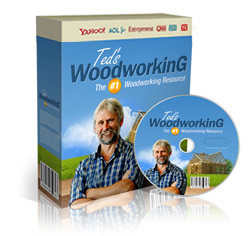 Have you secured TedsWoodworking yet? Bad news is, I must have underestimated the amount of people who wanted to get in ... because Ted's server actually fell over. However as his way of apologizing, Ted has informed me that he will extend the offer for 1 more day. If you really want to get your hands on 16,000 projects (and I’m guessing you do or you wouldn’t have even visited the site), then you should grab it right now. Remember, not only will it give you step by step instructions on whatever you're working on, but it will also give you tons of ideas for your next woodworking project. P.S: This is your last chance to grab all 16,000 plans at this discount price. I've been told that Ted will only extend this offer until midnight tonight and this offer will NOT be repeated again. Product reviews and pre-selling articles are one of the most powerful ways to "warm up" your visitors before getting them into buying mood. Download these presell and review articles to use on your blog or sites. IMPORTANT: Remember to rewrite these reviews for uniqueness. You won't rank if you simply upload these unchanged. Here are some great tips to get free traffic to your affiliate link. It works even if you don't have a website! By adding your affiliate link to your email signature, every time you send an email to someone, you are potentially making a sale with us and making money! Just replace YourClickbankID with your ClickBank ID. If you have another type of email account, simply google how to add a signature to whatever type of email account you have. Post interesting woodworking projects and articles on your Facebook wall WITH your affiliate link. This is one of the best ways to generate some quick money! Create an interesting post talking about how you found this website, and post it on your facebook page. Make sure you include a link to our website. Either broadcast your affiliate link with some text talking about our program to your current followers, or create a new twitter account, and start following as many people as you can who are interested in "woodworking". Once you have enough people following you back, you can tweets promoting our program and earn money! Did you know that YouTube is the second most popular search engine in the world? It is simple to make money and generate free traffic to our offer using YouTube. All you need to do is create some review videos that review the offer, and talk about how you have had success with the program. Use keywords in your video title that are related to our program to help rank. Make sure to include your affiliate link inside the videos! Another EXCELLENT thing you can do, is simply comment on every YouTube video you see that is related to "woodworking" and include your affiliate link in the comment section of the videos. Use pictures and images you create, generate free traffic for you, that you can funnel into your affiliate link! Create an instagram or Pintrest page, and start uploading interesting pictures or images that you own. It is important to try to build a "following". Pick a niche relating to woodworking - eg: DIY Furniture. Then post related pictures, the more the better. Eventually you will get followers, which will in turn visit your links you post in your account! Doing a press release can generate an enormous amount of traffic. Most people don't know there are services that offer it for free! Start a blog or review site that is related to woodworking. IMPORTANT: Write unique, interesting and informative articles. Google ranks unique sites very well! If you're writing a review article, ensure it is original and show the pros and cons. Ultimately tell the visitors why you think they should choose our program. Over time google will index your blog and you will get more and more natural traffic. You will get a complete strategy guide of how some of my affiliates are making an easy $35K/month or more as an affiliate of Tedswoodworking.